"This is the best recipe for any Tetrazzini! The chicken can be replaced with turkey, beef, pork, or seafood. It can also be made with only vegetables. It's a great one-dish meal or even a side dish." Heat butter in a large skillet over medium heat. Stir in chicken pieces, and cook to brown. Stir in mushrooms, and brown. Add red pepper and green onion, and cook several minutes, stirring constantly. Stir in flour, and cook several minutes, stirring until well blended. Gradually stir in chicken broth, cream, and sherry; cook, stirring, until smooth and thickened. Season with salt, pepper, and thyme. Meanwhile, bring a large pot of lightly salted water to a boil. Add pasta, and cook until just tender, about 8 minutes; drain. 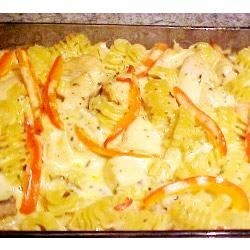 Toss chicken mixture with pasta, Parmesan cheese, and parsley. Spoon into a 1 1/2-quart baking dish. Bake in a preheated oven for 35 minutes. Remove, top with Jarlsberg cheese, and return to oven; bake until cheese is melted. See how to make an easy baked chicken tetrazzini. Ours turned out great. We added some Monterey Jack cheese with the parmesan and we've used broccoli or asparagus instead of the red pepper on occasion. Awesome. I made a few substitutions, but the basic recipe is wonderful. Not very flavorful. I added quite a bit of garlic and pepper and still very bland and too dry. We threw the majority of it out. Will not make again. I used milk instead of cream, broccolli instead of mushrooms. I added garlic, and garlic salt. I cut baking time to 25 min. It was delicious and low fat!